Walk-up spot in Rainbow Mall offering hot & cold beverages, Acai bowls, sandwiches, snacks & various flavors of shaved ice. 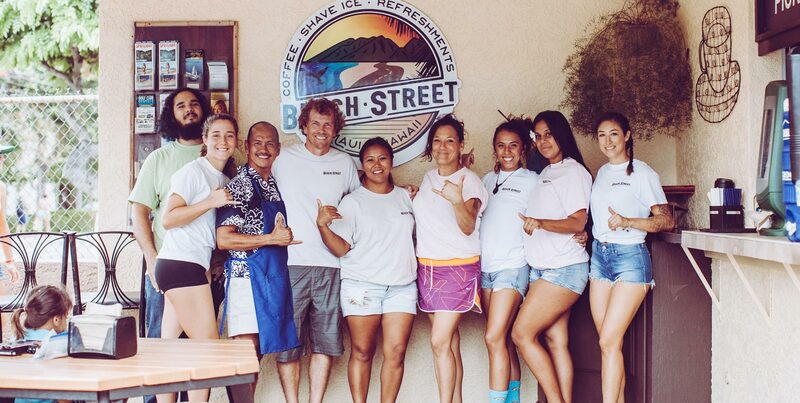 Opportunities at beach street: Competitive pay – plus tips (Totaling over $23/hour for most shifts) . Work hard in a fun and exciting atmosphere and make a great income. Job description: The applicant should be personable with great customer service skills and enjoy working with a team in a fast paced environment. You need to be flexible with your schedule and open to working weekends. You will wear different hats in this role as a barista, line cook, cashier, cleaner, stocker and more. Attention to detail and dexterity are a must as we work fast and prepare the highest quality products. Lifting of up to 50lbs may be required from time to time. About the company: We prepare and serve the finest coffee/espresso, breakfast items, smoothies, milkshakes, acai bowls and shave ice on Maui. We are a family owned company for over 18 years in one of Maui’s top locations. No previous experience required, however compensation will be based on applicant’s ability to perform required tasks and experience. You should be: positive “team player” attitude, multitasker, dependable, willingness to learn and open to feedback. If this description sounds like you, we want to talk. Apply in person at our location: 2439 S. Kihei Road.